The intimate wedding in San Sebastian of this American couple was one of those weddings in destination that I really like to photograph because they are always different and original. April and Kyle are an American couple who in one of their trips fell in love with this city in the Basque Country and decided that for their big day they would celebrate a destination wedding in San Sebastian, a beautiful place in the north of Spain where I have already work as wedding photographer in Spain like Jess and Blain intimate wedding in San Sebastian. They chose to celebrate a winter wedding, informal and very exclusive, which was attended only by bride, groom and three couples of intimate friends. 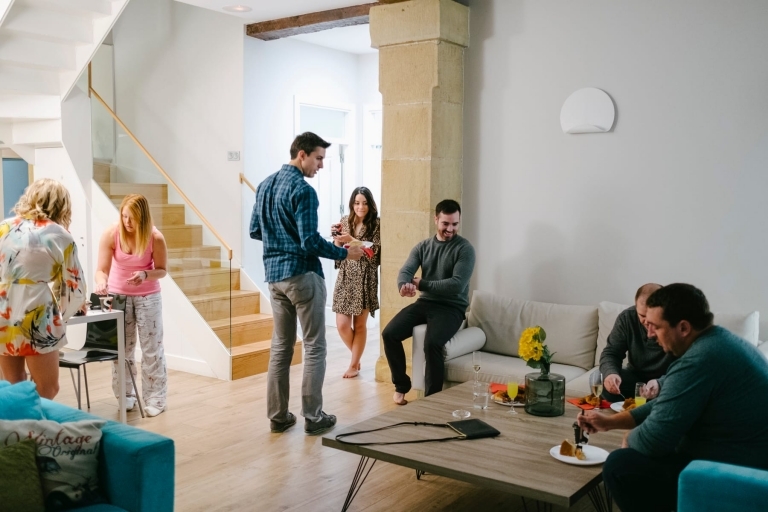 They all stayed in a lovely rented apartment in San Sebastian city center, where all the wedding preparations took place. For the big day they got up very early and after a rich breakfast the wedding preparations began. The bride got ready in the apartment with the help of her friends. For her big day the bride chose a white dress with a deep-veined neckline, Stuart Weizman shoes and loose wavy hair with a small ornament. The bridal bouquet was made up of pink, white, and red flowers. The groom decided on a more casual style with a dark suit and no tie. The event took place in October and hence the weather was a little unstable but still the ceremony was beautiful and we were able to enjoy the wonderful landscape of the Basque Country that witnessed the rainy wedding of this American couple. 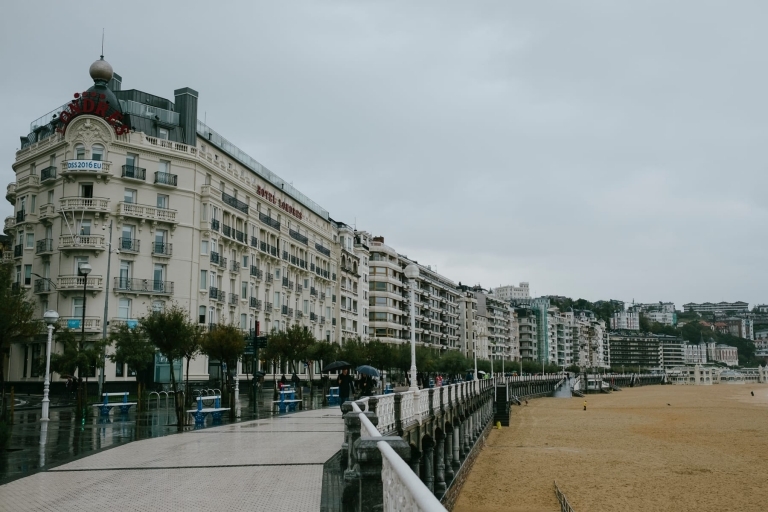 But April and Kyle were determined: they wanted an informal and original destination wedding, accompanied only by their closest friends and in a dreamlike place such as San Sebastian in the Basque Country. 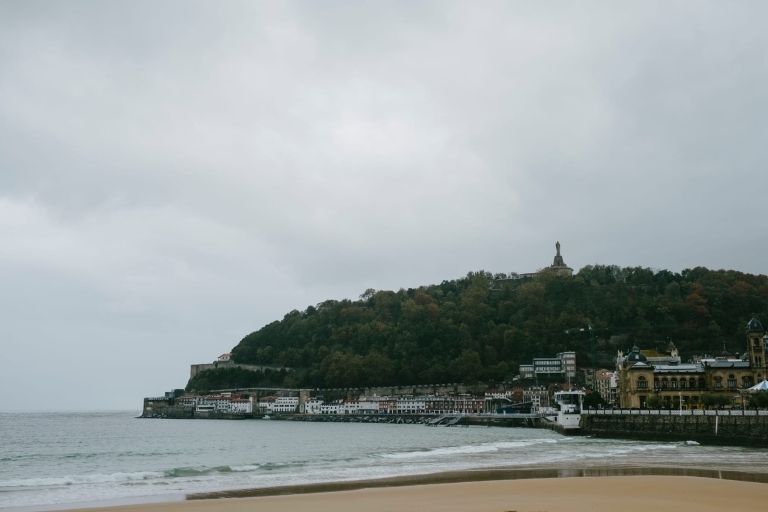 Once they were ready we headed to the place where the ceremony would be held, the Mirador Monte Igueldo, the most beautiful place in the city, with incredible views of the bay, a dream place to get married in San Sebastián. On the way it rained a bit, but it was no problem as we were well prepared. On the way to the place where the wedding ceremony will take place, we walk around La Concha beach where we took some great photos of the couple and then we rode the funicular to Monte Igueldo, where the blessing ceremony will be held. The bride and groom were very emotional and it was a beautiful civil ceremony and the fact that they got a rainy wedding resulted in very different and special wedding pictures. After reading their vows and performing the exchange of rings and saying “I do” the blessing ceremony ended and we started with the wedding pictures photos of the newlyweds in the funicular at Mirador Monte Igueldo. To complete this newlywed photo session we went to several points of San Sebastian that the couple had chosen to make their wedding photos: the port of San Sebastian, the beach of La Concha and the merry-go-round of the port where we shot some very romantic photos. After this we went to have dinner, and as is typical in this area of Spain, we went for Pintxos! They are small finger foods typically served at bars and taverns all throughout the Basque Country. They are quintessential Basque and form the backbone of the local food culture. But on the way we stopped to buy the cake in a very old and typical pastry shop in San Sebastian where the newlyweds and their friends toast to the new life of the couple! After his intimate wedding in San Sebastian, April and Kyle and also their friends, took advantage of this destination wedding to travel around Europe. If you are thinking of celebrating a destination wedding in the Basque Country do not hesitate to contact me. I will be delighted to accompany you and to be your wedding photographer in San Sebastian.